Hi guys! It's Friday! I'm soooo happy about the upcoming weekend...but I'm already looking forward to next week! First, Monday starts the Digit-al Dozen Love & Heartbreak theme week. There are tons of ways you can interpret this topic and I'm looking forward to seeing what the other ladies come up with! Next Thursday, we'll draw winners for our We Love Our Readers Valentine's Day Giveaway! So be sure to enter if you haven't already! China Glaze has been promoting Coconut Kiss as a February birthstone month color. I'm not a February baby (not even close really), but I was motivated to pull this one out of the stash archives. This polish is a throwback...originally released as part of the 2006 Fiji Fling Collection. It's a metallic-y royal purple that's shimmery, but not too frosty. For today's mani, I used two coats of Coconut Kiss, followed by China Glaze I'm Not a Lion and Smoke and Ashes for the leopard print. I'm Not a Lion has the distinction of being the FIRST nail polish which compelled me to purchase a backup bottle! That's an enormous compliment because a) I'm cheap, and b) I have a LOT of polish already! It's a neutral, holo-ish gold that's opaque in two coats. I used it as the centers of my leopard spots. 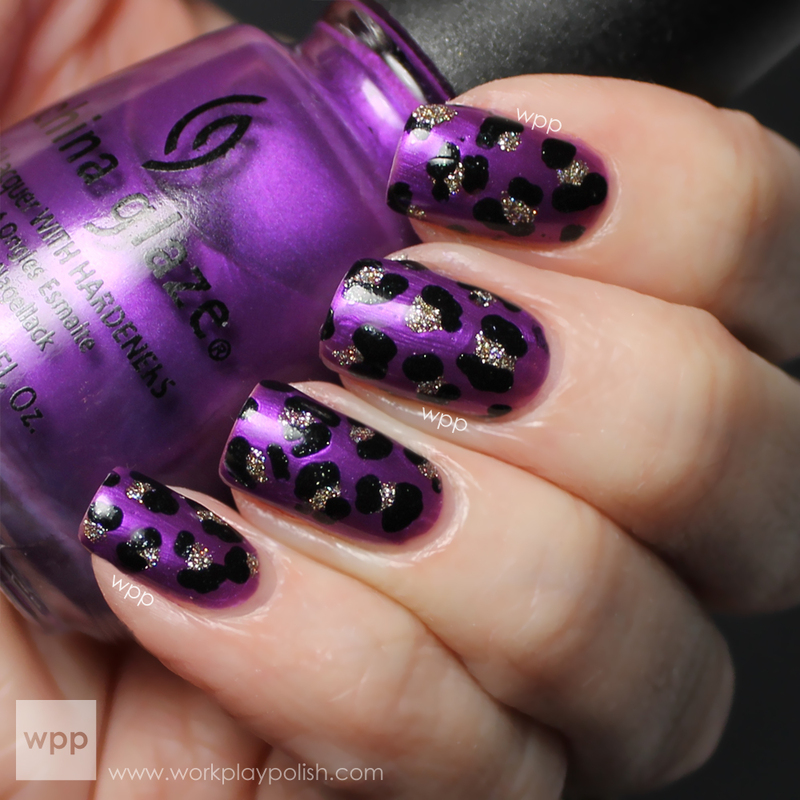 I dabbed China Glaze Smoke and Ashes around the perimeter of the spots to create the pattern. Smoke and Ashes is from them 2011 Hunger Games Collection. It has a green flavor...but you can't really tell in this mani. I think leopard makes any polish fabulous. But I really do like Coconut Kiss. 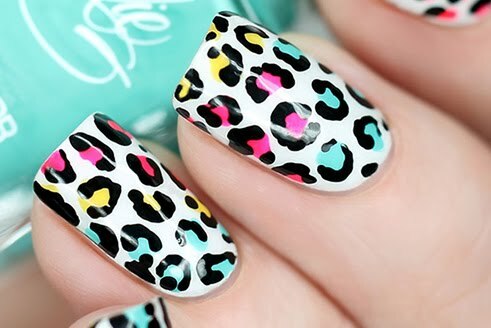 If you haven't tried a leopard mani yet...you should. Super easy! 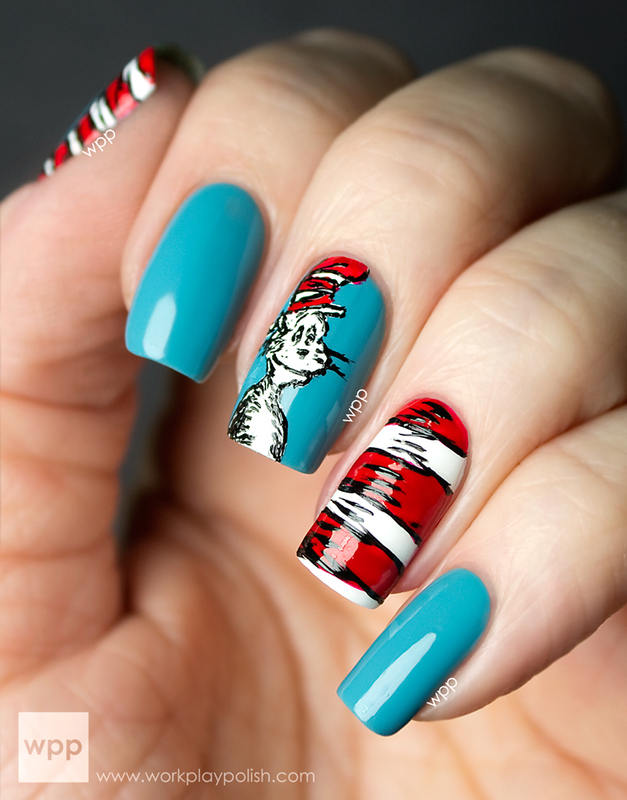 Here's a link to a great tutorial by Chalkboard Nails.